Well, first let me suggest we substitute the words "bad feng shui" for "challenging feng shui" or "feng shui concerns". It is more empowering, as well as more accurate. You can change almost any so-called "bad feng shui" situation for better if you know how to take care of it. When a bathroom is located over the main door, it becomes very important to take care of its good feng shui, as the quality of energy that comes through the main door determines the quality of energy in the house. As you know from numerous feng shui tips on this site, bathrooms do have a bad reputation in feng shui, be it a bathroom in the love area, a bathroom in the money area or a bathroom above the bedroom. By their nature, bathrooms tend to have stagnant, low energy, and draining energy. Always take care of the feng shui basics first: clean and clutter-free is a must before applying any feng shui cures and remedies. Create a strong, solid separation between the two spaces - the upper bathroom and the main entrance below it - by focusing on the bathroom flooring. 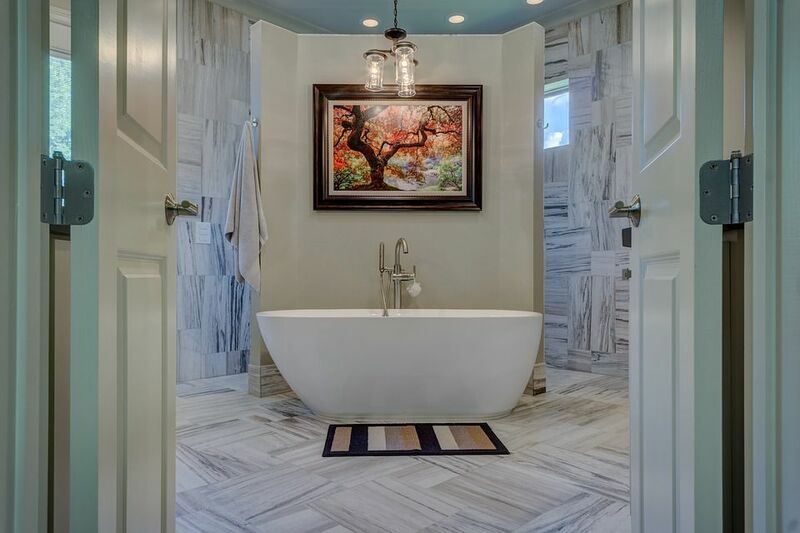 You can either have deep color flooring (colors depend on the ​bagua area the bathroom is located) or have a good quality bathroom rug in the same colors. Emphasize the good feng shui in the bathroom by strengthening the needed feng shui elements and keep the bathroom door closed at all times. See if you can have a strong lighting fixture in the main entry, such as a crystal chandelier, for example. This will further strengthen the division between the two spaces - the main entryway and the bathroom above it. Focus on maintaining good feng shui in your main entrance and see if you can visually heighten the main entry space to energetically push up the energy of the upper bathroom. You can do that in many decor-appropriate ways, such as by using beautiful wall paper with mostly vertical movement/stripes, tall lamps on a console table, or a tall mirror. Be mindful how you place the mirror in relation to the main door. This is about it. It is simple, logical, and easy, but it is also something to keep an eye on at all times to be sure the energy stays fresh and clear. The interesting fact that you might discover as you start applying feng shui in your life is that there are no ideal feng shui houses out there. Some houses will have better feng shui than others, but the concept of an ideal feng shui house is as naive as the concept of an ideal partner. We are all work in progress, and this applies to houses as much as it does to people.